This image shows a 3-pound bag of rock crystal tumbling rough, dumped into a colander and sprayed with water - just as we do with every other rough. Click on the image for a larger view. This is transparent colorless quartz and the photo does not do this wonderful material justice. , , and What do they mean? "Rock Crystal" is a popular name for a colorless quartz that is clear enough that you can see thorugh it. It is rarely seen as a tumbling rough and we have a small quantity that we are offering for sale. It is in large chunky pieces that range between about 1 and 2 1/2 inches in size. This photo shows how nice our rock crystal rough shapes and polishes following the tumbling recipe below. 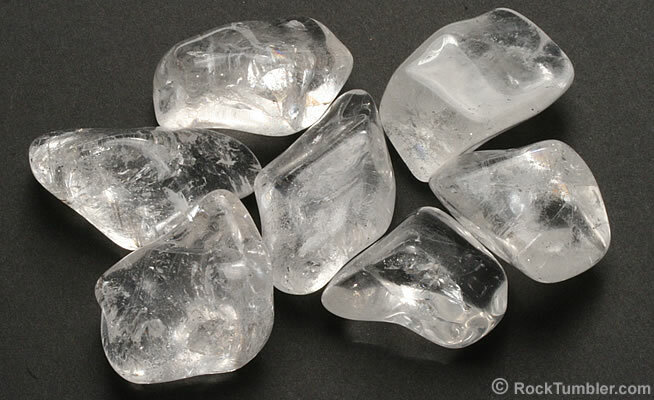 1) More Time: Crystalline quartz is hard and because of that it requires more time in the tumbler with coarse grit to produce nicely-shaped tumbled stones. For the rough that we are selling, in six-, twelve- and fifteen-pound capacity barrels, two to four weeks might be required to shape the rough nicely. In small tumblers of two or three pounds capacity, three or four weeks - or longer - can be needed. 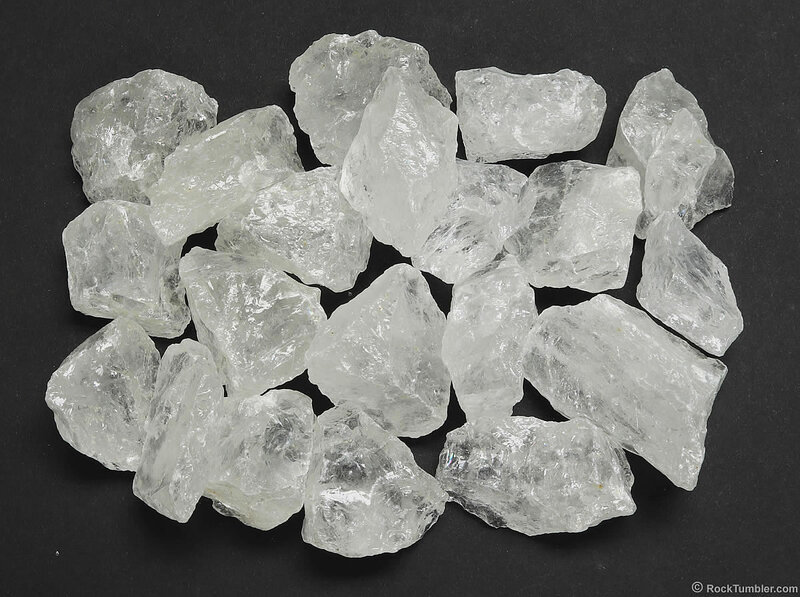 We suggest tumbling crystalline quartz in coarse grit for two weeks, clean the rough and the barrel, then run one or two more weeks in coarse grit - until you are happy with the shape. When you are happy with the shape, move on to medium grit. 2) Media Needed: You want crystalline quartz to be swimming in a sea of ceramic cylinder media. This is required if you want to avoid bruised tumbled stones. When we tumble crystalline quartz in coarse grit, we fill the barrel about a third of the way with ceramic cylinders and then add the quartz. That will give you a ratio of about 70% quartz and 30% ceramics. The cylindrical shape of the ceramic media will act like a roller bearing and give the rocks a smooth tumbling action in the barrel. The small pieces of media also deliver grit to all surfaces of the rough. Using Small-Size Rough Instead of Media: Some people use small pieces of rough instead of media. This can work well if your small rough meets two requirements: 1) the small pieces of rough must be blocky or rounded in shape to produce a good tumbling action - thin or flaky pieces will break up quickly and might not produce a smooth tumbling action; 2) the small pieces of rough must have a hardness that is equal to or greater than the rough that they are tumbled with - if they are softer they will tumble into mud before their job has been done. Barrel slurry dumped down the drain will harden like concrete. Coarse Grit Step: Fill the barrel 2/3 full with a mix of 20% media and 80% rock crystal. Add two level tablespoons of coarse grit per pound of material and cover the rocks completely with water. Then tumble for two to four weeks - or long enough to shape and smooth the stones. Medium Grit and Fine Grit Steps: Again, fill the barrel 2/3 full. Your rough volume will have dropped because of loss during the coarse and medium grit steps. Add some additional media to bring the barrel up to proper level. This should get the media up to the suggested 40-50% of barrel capacity. Use two level tablespoons of grit per pound of material for each of these steps. Add enough water to almost cover the rocks and tumble for one week. Don't over-tumble at this step. If you allow the rocks to tumble more than is needed, you run the risk of bruising. Polish Step: Be sure that the rocks, media, barrel and lid are extra clean. Also, make sure that the barrel is filled to the proper level. Add more media if needed, but if you have to add more media be sure it is clean POLISHED media. Dusty media or media that has not been broken in and smoothed can scratch up your tumbled stones at this step. We use two level tablespoons of TXP aluminum polish for each pound of rock. Add water until it almost covers the rocks, and tumble for one week. Burnish If Needed: This material usually takes a great polish. However, burnishing it after the polish step can often improve the look of the stones. If you would like to try burnishing, full instructions can be found here. Coarse grit is not used in a vibrating rock tumbler. After you have your bowl loaded to the manufacturer's recommended level add 1 tablespoon of grit for every two pounds of material, including the media, in the bowl. While the tumbler is running, slowly add water until the material has a thin coat of wet grit and the tumbling action is smooth and fast in the bowl. Check the bowl every 8-12 hours to ensure the action is still good. If the action has slowed, add water a little at a time until the action is back to normal. If the mud gets too thick you will need to do a complete rinse of the material and bowl. After rinsing, add fresh grit and water and start tumbling again. You are done with medium grit when you are satisfied with the shape and smoothness of the stones. Usually 4-7 days for us with this material. Give the material and bowl a thorough cleaning before moving on to fine grit. Place your material back in the tumbler bowl, then add enough polished ceramic media to bring the load up to the manufacturer's recommended operating level. This will also get you near the recommended 50% ceramic media for the polishing step. Add one tablespoon of grit for every two pounds of material in the bowl. Then, turn the tumbler on and slowly add water until the material has a thin coat of wet grit and the tumbling action is smooth and fast in the bowl. Open the bowl every 8-12 hours to check the action is still good. We usually run fine grit for 48 hours. Thoroughly clean the bowl and material before moving to the polishing step. Place the cleaned material back in the bowl. If needed, add ceramic media that has been previously polished, to bring the bowl up to the manufacturer's recommended operating level. This media should be washed thoroughly before adding to prevent adding contaminant dust particles that might behave like grit in the polishing step. Add one tablespoon of polish for every two pounds of material in the bowl. Turn on the tumbler and slowly add water. Stop adding water when the material has a thin coat of wet polish and the tumbling action is smooth and rapid. Like the previous grit steps, open the bowl every 8-12 hours to check the tumbling action. Add water if it has slowed. We have found that 48 hours is usually all the time you need to get a good polish in a vibratory tumbler. Any more time than that and you run the risk of damaging / bruising the material. This rough will usually take a great polish. However, burnishing this material after the polish step can often improve the look of the finished stones. If you would like to try burnishing to see if it improves the look of your polished stones, full burnishing instructions can be found here. If you would rather just purchase tumbled stones of this material. We usually have medium-size tumbled Rock Crystal here. 1 pound of each: coarse, medium and fine grit. 8 ounces of TXP polish. This is enough supplies to tumble up to four three-pound barrels of rocks. Save money with a large grit kit.